Goro Koyama is a Toronto based foley artist and native of Japan. He won an MPSE for his work on Blade Runner 2049 and you can hear more of him in the upcoming film, Creed II. 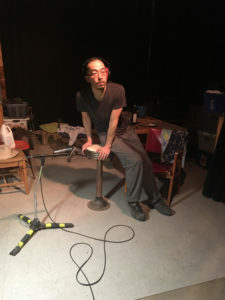 Goro recently travelled to New York City to perform foley live at the Japan Society for 450 people. 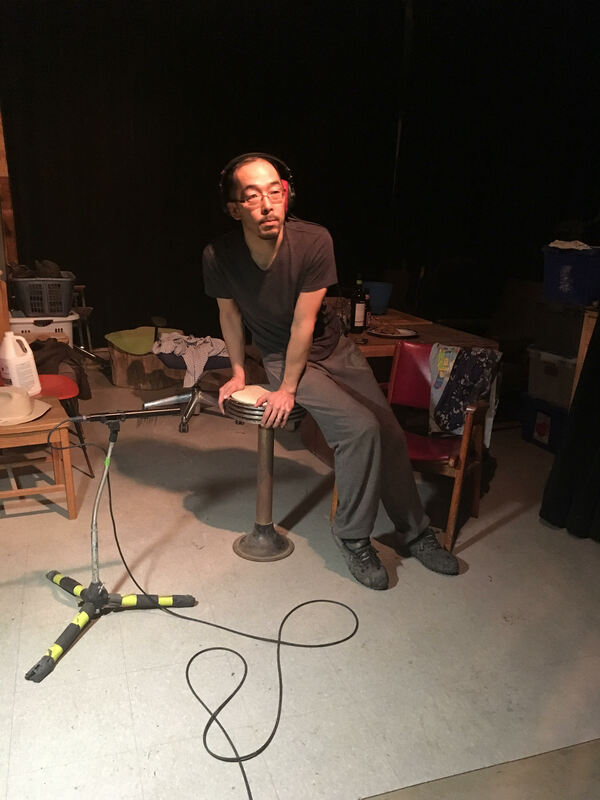 With the theme of this month being inversion, I asked Goro if he could speak to us about the inverse qualities of performing foley live on stage for an audience. Chelsea Body: Thanks for taking some time to speak with me today Goro! How did you come to be a foley artist here in Canada? Goro Koyama: I came to Canada when I was 18 years old. I graduated from high school in Japan and I came over here. I was first in Ottawa for English studies. I did that for a year and at the end of the program, I thought now that I know English, I might as well try college. I’d always wanted to study film but I was not very attracted to Japanese films at the time – I was always all about ‘Hollywood’ and English study was supposed to be a step before that. And then I applied to Confederation College in Thunder Bay and they accepted me and they had a great film program that I had heard about so I was accepted into it and I moved to Thunder Bay. CB: What brought you to Toronto, and to foley? GK: So at the end of film production at Confederation College, I needed a job placement and I was looking around and someone who was working at a sound studio in Toronto, told me about it. And at the time I wasn’t especially looking at the sound aspect of film. Like all the other film students, I thought I was going to be the next big director. But they were driving down to Toronto so I rode along and went to the studio and in one of the rooms, I saw a foley stage. And as soon as I walked in, I saw Andy Malcolm performing and that’s it, I knew this is what I want to do. That was July 1994; that was day one. Andy was working on this big sci-fi film called Stargate and that’s when it was love at first sight for me and the craft. CB: How were you approached to do this live foley performance? GK: I was approached by the Japan Society of New York which in my previous visit to the city, I had met someone from there and we chatted about how I liked doing workshops. I do like sharing our craft – how interesting it is and how it amuses people when we demonstrate our stuff. We normally work in a dark room but I like sharing that with people; with kids. So that was back in January and a couple months ago I received an email from them and they were planning a Halloween event – a film screening with live sound of a ghost film so they wanted me to come down and make some spooky sounds using household items. I thought that was a fun idea and said yes, of course. We performed to a film called Posessions by Japanese animator Shuhei Morita. This film was nominated for an Academy Award a few years ago. CB: The theme this month is inversion. How did you find this performance to be an inversion or different from what you regularly do as a foley artist? GK: I think foley is to a certain extent an art of inversion and I felt very much that way as I was practicing for this live performance because the regular foley job is about creating the sound and adding the sound to the picture. It’s often the sound that didn’t get recorded or the sound recordist didn’t want on the dialog tracks so we have to go back in and add those sounds. So we’re creating the sound that was either not wanted or not recorded and we spend so much time making it unnoticeable; so it’s a funny craft that way. Doing a live performance of it is yet again backwards because it would be easier to cut the sound and record and edit it but instead of doing that, we’re going to perform it live because it’s fun. We choose to do it that way even though it’s not the best way to create that sound. In that sense, it’s organic. It’s live but still, it’s not the real sound. I was using a galvanized garbage can to make the thunder sound. I was using a wooden box for wooden clogs, audio tape for grass and foliage; so we’re not using the real thing but it’s live so I felt backwards about it and I enjoyed that a lot. CB: What were the challenges of performing foley live? GK: There were technical challenges. We had 11 microphones pointing at us so avoiding feedback and making sure that every sound gets picked up was a challenge. Stage fright (laughs) is a challenge. I was wearing a Halloween costume that added to the challenge. I couldn’t see (laughs). I had my mask open but still… it was hot. And of course, 300 eyeballs staring at us. The challenges in between the sound effects – how to get from one prop to the other can be a challenge and often has to be done quietly but we had set it up so we could do it with minimum extraneous noise. Choreographing the whole thing was the hardest part and took the longest. CB: How much time did you spend practicing? GK: I worked with Joanna Fang, a foley artist from New York so we were both practicing on our own at first. I practiced at home for 3 weeks and she did the same and I finally flew down to practice with her just before the show. CB: What do you think audiences get out of this kind of performance? GK: I was asking myself that question as I was performing. Any time I do something like this, people are entertained by it. It’s simple and an antique way of doing sound effects but it seemed to amuse and entertain people a lot. And I was thinking about why that is. Part of it is the satisfaction of things being in sync with the picture and often I feel when I make a sound and it’s dead in sync with the picture, I feel all the eyeballs turning to us to see “how do they do that” or “how are they making all those sounds with only two people on stage”. That’s satisfying to me as the performer. I think because it’s so simple, it connects with audiences. Kids are very keen about it but for the parents, the adults, it brings out the kids in them. CB: Now this isn’t the first time you’ve performed foley live. You were a part of the worldwide tour of Guy Maddin’s Brand Upon the Brain. How did that live foley experience inspire this show? GK: Brand Upon the Brain was a spectacular show and it was big. It was very psychedelic, weird and fun. But because of the style of the film, it wasn’t for everyone and it was very labour intensive, very involved. It involved a lot of props and a lot of people so that’s what made it so spectacular and great but I wanted this one to be more accessible, more for everybody. And as this was presented as a family event, I thought this was perfect – I always wanted to do a show that’s for everyone and Possessions was great for that. I used household items that every child can find around their house. This was an accessible version of the live performance. CB: Would you do a live show like this again? GK: I would in a heartbeat. It’s a buzz.